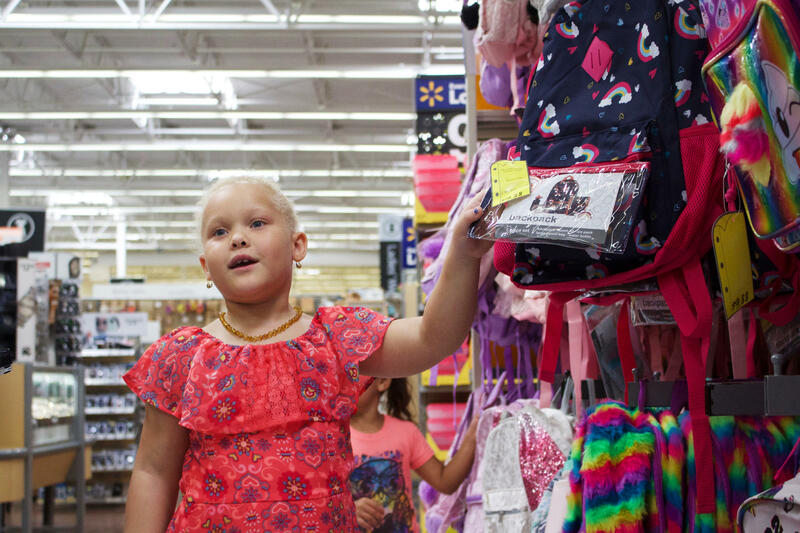 Andrea Conyers and her daughter Aviana, 7, went back-to-school shopping in Hinesville, Ga., earlier this month. Aviana Conyers browses backpacks while shopping. Natalie Mondesir, a fourth-grade teacher in Liberty County, Ga., shops for her son's eighth-grade science class. Conyers looks at the back of a package of colored pencils. Her cart is split about half-and-half between American- and foreign-made products. As the items come together inside the Conyers' shopping cart at the Walmart in Hinesville, Ga., it tells the story of America's place in the world. There are crayons, glue sticks, hand sanitizer and tissues that are made in the U.S. Markers are U.S.-assembled. The notebooks are from India. Pencils are from the Philippines. Earbuds, pink pencil case and Aviana's new colorful backpack are from China. In a sense, this shopping cart represents a microcosm of how tied America is to global trade, something that's currently being shaken up and renegotiated by President Trump. The new U.S. policies have put the country on a path to a trade war with much of the world, especially with America's biggest trading partners: Canada, Mexico and China. So far, new tariffs on imports and exports have mostly been felt by U.S. manufacturers and farmers. And it all can feel distant when you're just a consumer, shopping in the store. So NPR set off to see: How much does global trade show up in the basket of regular American shoppers? Think of the journey of the simplest back-to-school item: a pencil. It might get wood from one place, graphite from another, the rubber eraser from a third place, and everything might get assembled in yet another country and then shipped to be sold all over the world. The vast majority of global trade works this way. 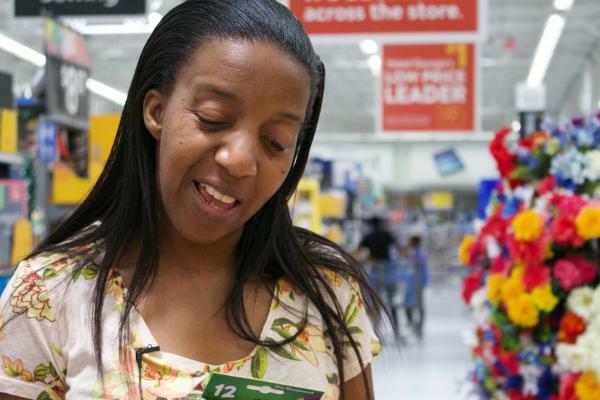 Sometimes, this realization can creep up on you, like it did for Natalie Mondesir, a fourth-grade teacher shopping for her son's eighth-grade science class. "I always go Crayola," she says, picking up a box of colored pencils. To her, Crayola is associated with childhood — she visited Crayola's factory in Pennsylvania as a child. Mondesir turns the box of Crayola colored pencils in her hand, looking for the label. "Made in Brazil." She pauses. "You just broke my heart," she says, laughing. Turns out, Crayola crayons are made in America, but the colored pencils aren't. 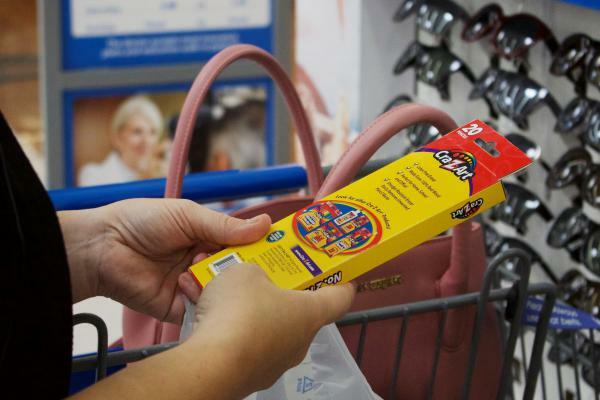 A Crayola spokeswoman says the company has sourced colored pencils from Brazil since the introduction of the product in 1988. "Crayola colored pencils are manufactured in Brazil due to their high-volume manufacturing capabilities," she said in an email. To Mondesir's disappointment, almost all of her purchases on this shopping trip turn out to be made overseas, including her favorite pens. She spends a few minutes searching for a padlock for her son's locker, and finds that American-made options just aren't available. All are made in China, except for one made in Taiwan and packaged in the U.S.
Andrea Conyers' shopping basket ends up split about half-and-half between American- and foreign-made products. 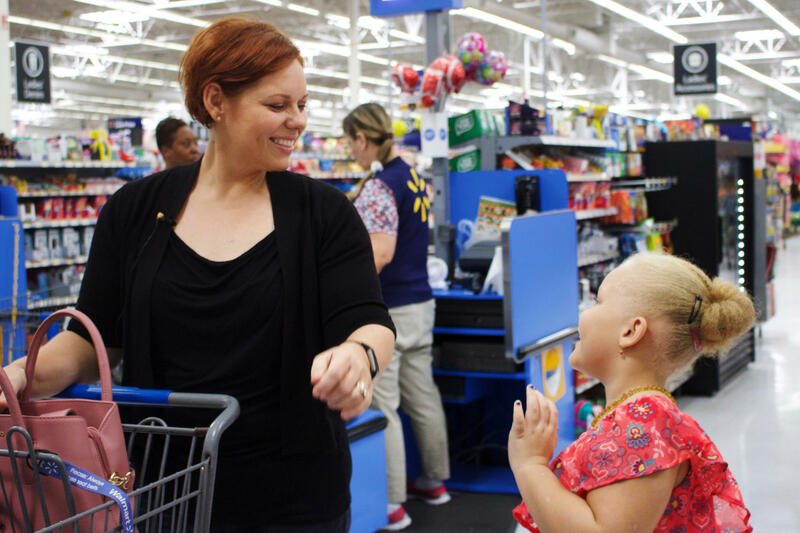 "I'm pleasantly surprised," she says, adding that she usually only pays attention to the origin of her purchases when the quality really matters for her, such as food or clothes. "Whatever you buy local, it goes back into your local economy," Conyers says. The benefit reaped by local economies is exactly what is underpinning the new trade policies. The U.S. imports more than it exports and President Trump blames that on cheap prices and China's trade policies. He wants to raise the cost of importing foreign products to encourage American companies to manufacture in America, buy supplies in America — create jobs in America. But for years, mass-produced goods have gone through the complex global supply chain. David Dollar, an economist at the Brookings Institution, says more than half of global trade is basically components crossing borders to be eventually assembled into a final product that a shopper might buy. "For anything manufactured, it's likely to cover quite a few different countries," Dollar says. Trump's trade policies stand to shake that entire equation. And restricting America's role in this global economic web could eventually lead to higher prices at the store, economists say. Very few supermarket items have so far been directly affected by the escalating trade dispute. But the next wave of tariffs is expected to hit more consumer-oriented products. It's unclear how much companies will be able to eat the costs instead of hiking up the prices for shoppers. Mondesir is particularly worried about one big-ticket item she wants to buy this year — a new car. The auto industry is bracing to be swept up in a costly tariff war. "I know that prices of cars will probably go up by the time I'm ready to buy a car," Mondesir says. "So I'm also mentally preparing myself to maybe dish out a little more to get my car." When you're shopping, how often do you think about where your purchases come from? I mean, are you looking at the labels to see where those goods are made? I, for one, don't. Maybe I should. As President Trump has been shaking up America's international trade relationships, NPR's Alina Selyukh did want to see just how much of the world is represented in our shopping baskets, and she sent this report from Hinesville in southeastern Georgia. ANDREA CONYERS: Sweetheart, why don't you look at some backpacks? CONYERS: Sharp turn, sharp turn, sharp turn. SELYUKH: Her daughter, Aviana, is very organized. She's 7 years old. She's got her second-grade supply list in hand, asks her mom for a pencil to cross things off. AVIANA CONYERS: OK, what's next? So two pink erasers. So let's go for the dry-erase markers. CONYERS: All right. You need a fine tip. AVIANA: Now, let's go find hand sanitizer. SELYUKH: Of course, the most exciting purchase is a new backpack. What kind of backpack do you want? AVIANA: Well, whatever my mom chooses. SELYUKH: Sure, we believe you, Aviana. She ends up choosing a colorful pack with a strand of doll hair. I'm following the Conyers' shopping trip today for a bit of a thought experiment. President Trump has put the U.S. on a path to a trade war with much of the world, especially with America's biggest trading partners - Canada, Mexico and China. So far, the new tariffs on imports and exports have mostly been felt by U.S. manufacturers and farmers. But it all can feel distant when you're just a consumer shopping. I wanted to see how global trade might actually show up in the baskets of regular American shoppers. Many of them are now stocking up on back-to-school supplies. Conyers and I sort through her basket, searching the labels of pencils made in the Philippines, ear buds made in China, a few notebooks. SELYUKH: Traveling around the world here. CONYERS: Yes - Brazil, India, China. CONYERS: Made in the U.S.
SELYUKH: Her basket ends up being split about half and half between foreign-made products and things made or at least assembled in America. CONYERS: Actually, I'm very pleasantly surprised. SELYUKH: She says she usually pays attention to where her purchases come from when the quality really matters for her, like food or clothes. CONYERS: Whatever you buy local, it goes back into your local economy. AVIANA: A pack of pencils. SELYUKH: A pencil might get wood from one place, graphite from another, the rubber eraser comes from a third place, and it might all get assembled in yet another country and then shipped to be sold all over the world. The vast majority of global trade works this way. Trump's trade policies stand to shake that up. Economists say eventually restricting America's role in this global web could lead to higher prices at the store. NATALIE MONDESIR: I am preparing myself financially. SELYUKH: Natalie Mondesir is a fourth-grade teacher here in Liberty County. MONDESIR: I am starting to save a little bit and buy stuff as much as possible while I can. SELYUKH: Mondesir also has two teenage children. MONDESIR: I'm usually looking for the best deals because not only am I buying stuff for my own personal children, I usually buy stuff for my class also. SELYUKH: Today, her shopping list is for her son's eighth-grade science class. And as we set off to see where her purchases come from, things get a bit emotional when Mondesir picks up a box of Crayola colored pencils. MONDESIR: I always go Crayola only because this has been childhood. I've been to the Crayola factory. SELYUKH: We look for the label. MONDESIR: As distributed - what does it mean by distributed? Made in Brazil. MONDESIR: Dang, you just broke my heart. MONDESIR: I went to the Crayola factory when I was little. SELYUKH: Turns out, Crayola crayons are made in the U.S. but Crayola colored pencils are Brazilian. As I follow Mondesir, we make a couple other observations. Foreign-made pencils are slightly cheaper than made in the USA and sometimes American made isn't even an option. MONDESIR: OK, now I got to figure out where the locks are. SELYUKH: Mondesir is looking for a padlock, the kind you put on a school locker. MONDESIR: Of course, it's made in China. OK.
SELYUKH: I'm guessing that one's also made in China. MONDESIR: Oh, no, no, Taiwan. SELYUKH: Packaged in the USA, though. SELYUKH: Very few of the supermarket items have so far been directly affected by the escalating trade dispute. But the next wave of tariffs is expected to hit more consumer-oriented products. It's unclear how much the companies will be able to eat the costs instead of hiking up the prices for shoppers. And Mondesir is particularly worried about one big-ticket item she wants to buy this year - a new car. The auto industry is bracing to be swept up in a costly tariff war. So Mondesir says she is preparing to pay more than she had expected. Alina Selyukh, NPR News, Liberty County, Ga. Transcript provided by NPR, Copyright NPR.